GSoC is a learning process - we learn to work together to solve a big problem by breaking it down into smaller chunks. This year, 2013, I got chance to work as student contributor at Numpy. And the experience was worth paying the amount of effort. 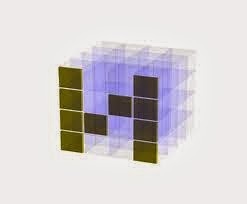 I have joined Numpy, the community that's quite friendly and helpful. I passed final evaluation but I value experience more than consequence (off-course passed makes me happy). Experience that I had for being a part of this program. Nothing could be more inspiring and motivational than working with people from almost every part of globe connected together just because of there love and passion for code and to develop amazing things. Also got chance to learn from such experienced and enthusiastic developers. What I gained this year? The most challenging aspect is to get work with people across different geographical reasons. People from different region thinks and act differently as they might have different concern. Coming out with product which is accepted by everyone is itself a strenuous task. To work in a team with huge diversity in timezone and thinking was colorful experience. Numpy used to release Global Interpreter Lock or GIL for all two or one operand loops. But for short length array, it used to produce relative overhead instead. So, releasing GIL for smaller operations was not benefiting at all. PyArrayCanCastArrayTo used to check evenif newtype is Null. In PyArrayFromArray, It was found that if argument newtype is Null, it get value of oldtype. So, technically it has to check if casting is possible for same type, which is useless. Numpy used to converts the Python scalar into its matching scalar (e.g. 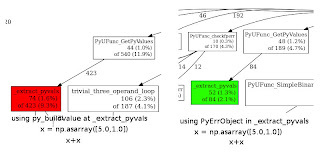 PyLong -> int32) and then extract the C value from the NumPy scalar. Clearing the error flags at every function call, then checking it. This happens unconditional even-if there is no need to do. For every single operation calls, numpy has to extract value of buffersize, errormask and name to pack and build error object. 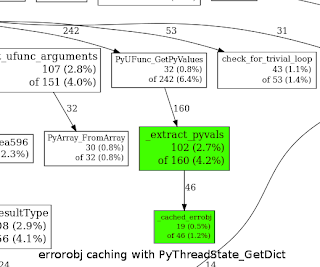 These two functions, _extract_pyvals and PyUFunc_GetPyValues together use significant time. It take useless time because all this time is spent on to look up entries in a python dict, extract them, and convert them into C level data. Not once but doing that again and again on every operation. Also which remain unused if no error occurs. loop selection method for scalar operation is inefficient and consume time. It check through all associated dtypes of function one by one from types array. When allocating the return value, numpy allocate memory twice. One for the array object itself, and a second time for the array data. Also, shapes + strides together have 2*ndim elements, but to hold them numpy allocate a memory region sized to hold 3*ndim elements. devising improved algorithms to solve them, with the goal of getting the numpy time as close as possible to the Python time. The very first objective to find bottleneck is profiling for time or space. 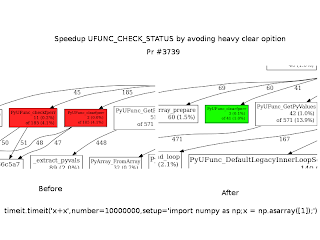 During project I have used few tools for profiling and visualizing data of numpy execution flow. This is the suit of different tools provided by Google. It Includes TCMalloc, heap-checker, heap-profiler and cpu-profiler. As need of project was to reduce time, so CPU-Profiler was used. 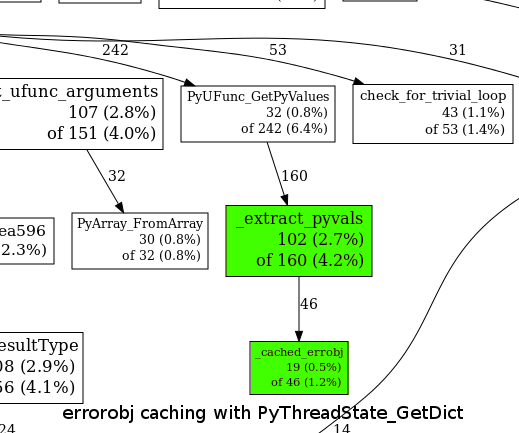 I my last post, I mentioned how two functions, _extract_pyvals and PyUFunc_GetPyValues together use >12% of time. But major culprit is *errobj = Py_BuildValue("NO", PyBytes_FromString(name), retval); in _extract_pyvals. It alone takes 10% of time, with every operations. First approach I take, was to cached Py_BuildValue with Thread storage or dict. With this time consumption of _extract_pyvals dropped to 4% from 12%. But since, TLS is a bit unreliable and risky. So @juliantaylor advised that it should be avoided. Even after many fixes, commit for this didnt managed to pass all test cases. For every single operation calls, numpy has to extract value of buffersize, errormask and name to pack and build error object. These two functions, _extract_pyvals and PyUFunc_GetPyValues together use >12% of time. I think it take useless time because all this time is spent on to look up entries in a python dict, extract them, and convert them into C level data. Not once but doing that again and again on every operation. Instead these values should be converted once, at time of loading or when they set in first place.